Ever wanted to see not only every file in a given directory, but all files within that directories buried subdirectories? If you’re looking for what is basically a recursive listing of files in a given folder, we’ll show a great trick for the Mac OS X Finder that allows you to do just that, and also demonstrate several more advanced approaches using the command line. 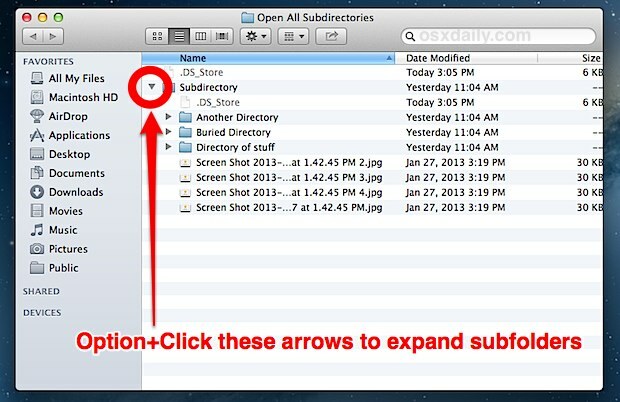 To quickly see what’s in all the subdirectories of a folder within the Finder, open the parent folder and change to list view. Now you need to hold the Option key and click on the little arrow alongside the name of the directory to expand that directory and all subdirectories at the same time. Option-clicking that arrow again will cause all subdirectories to close up, otherwise that becomes the new default view when clicking the arrow. Keep in mind that if you want to view hidden files through this method, you must enable hidden files to be shown in the Mac OS X Finder separately, which will then carry out through every folder until it is disabled again. The above approach is going to be the easiest method for most users, and the next two methods are focused on the command line and are aimed at those comfortable in the Terminal. To list all files recursively from the command line, you can attach the -R flag to the traditional ls command. This expands out subdirectories and lists the files contained within them. These commands will work in just about all forms of unix, from OS X to Linux or whatever else you may encounter. The output is decent, but it could be arranged better. Using the -lah flags in addition to -R will show permissions, ownership, modification dates, and it makes reading file information much easier. The -a flag is optional, allowing hidden files to be displayed as well. drwxr-xr-x@ 11 macuser staff 374B Jan 14 15:32 .
drwxr-xr-x 522 macuser staff 17K Jan 28 10:20 ..
drwxr-xr-x@ 6 macuser staff 204B Dec 9 13:43 .
drwxr-xr-x 522 macuser staff 17K Jan 22 10:20 ..
You’ll notice the path to each file is listed above the files themselves, expanding out the subdirectories a lot like the Finder method mentioned up top. You can get the path to proceed the file name though by using a different command entirely. Finally, if you want a list of all files with their complete paths specified, you can turn to the find command. The “-type f” flag signifies regular files only, if you want to show more objects or symbolic links you can check out the man page for find for additional information. How to open with one click all the folder in one directory, just clicking on the little triangle of one folder? If I remember well it was possible with System 9 with option click. i change to list view .. holding option and i don’t see the arrow from the left comes up.. 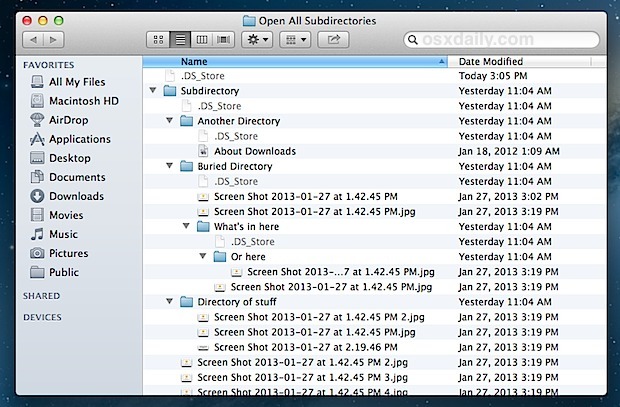 The first example (Finder) still shows the files in their subdirectories. I’d like to just get a list of files, then click on “Date modified” to find recent activity. Is this possible in Finder, or am I stuck with command line “find . -mtime ###” ?